You didn’t have time make breakfast in your suite at Art of Animation, or you kicking it old school in The Little Mermaid wing and there isn’t a place to make breakfast in your room. You’re in luck because there are tons of options down in the Landscape of Flavors food court. But you on the go, what do you grab? Let me suggest the Guava Twist. 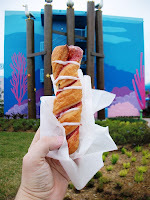 The bakery case at Landscape of Flavors has quite a number of options that you will find in the grab and go sections of every major resort food court in Walt Disney World. Just like the rest of the stations in Landscape of Flavors that feature a cereal bar or challah French toast, however, there are a few items that shake up the status quo. The Guava Twist is one such item. The Guava Twist is a flaky stick of pastry twisted around a stream of guava jam that is topped with a drizzle of icing. It is sweet and buttery at the same time with just a twinge of tanginess coming from the thick guava filling. For those of you that think cupcakes from Starring Rolls for breakfast is pushing the vacation breakfast envelope a bit too far, but still want a little sweet with your breakfast treat, this is for you. It strikes the right balance between sugar filled breakfast roll and the unadulterated croissant. If you have time to sit down for a quick breakfast, I highly recommend the smorgasbord of options available at Art of Animation’s Landscape of Flavors. However, if you’re running late for a bus and need something to sustain you through the first hour or two of park touring, let me suggest the Guava Twist. Rich, flaky pastry and sweet, gooey guava jam, what more could you ask for from an on the go breakfast snack?